Writing a graphic novel review is quite similar to writing a novel review. You need to show your own interpretation of the book, critical analysis and evaluation. But a graphic novel is in a genre of literature that combines text with illustrations. For this reason, you should analyze visual elements as well as explore their correlations with the text. The history of graphic novels is closely connected with the history of comics – that is why the artwork is the essential part of graphic novels. You should examine both the visual and written work of the graphic novel you chose to review. Define the subject and theme of the graphic novel. Describe the plot in a few sentences. Analyze the author’s writing style for graphic novel reviews. A) Read the graphic novel at least two times. For the first time, read the book to understand its general idea. 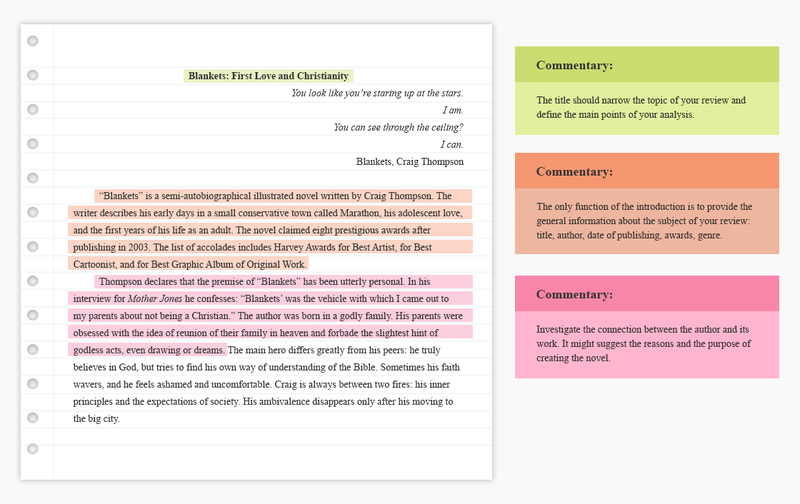 On your second reading, make notes about the writing style, characters, plot, and visual elements. B) Provide essential information about the graphic novel in one sentence. In the introduction, mention the title of the graphic novel, its author and artist, and genre. Also, you should point out the publisher, the format (hardcover or softcover) and copyright/release date. As additional information, you can mention its price and ISBN number. C) Identify the author’s/artist’s purpose of producing the graphic novel. If you write a review for original graphic novels, this task will not be difficult for you. The purpose may be mentioned in the preface of the book. If it is not, try to read an interview of the author/artist or deduce it by yourself, relying on your careful reading of the book itself. Tell what the graphic novel is about. Mention the story’s main events, but do not retell the whole story. Define its central idea. Introduce the major characters and think over how their background can influence the way they act. Pay attention to the author’s writing style. 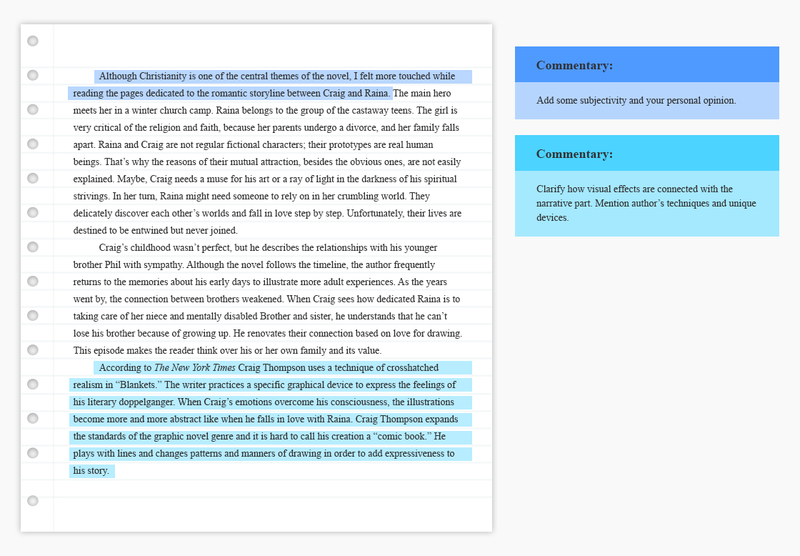 Read the text carefully and try to find the unique features of the author’s writing style: for instance, note the usage of paraphrases, metaphors, allegories, and epithets. Define whether the style is deliberate or poor. Describe the artwork. Define the general artistic style (realistic, psychedelic, cartoon-like, graphical, etc.). Also, depict what colors and tones dominate and what they symbolize. Explain if visual elements support or contradict the story. Probably, they replace the usage of words. Provide your interpretation of the graphic novel. How did you understand the graphic novel? Did it impress you or not? Think over its strengths and weaknesses and give examples. Is it worth reading? A graphic novel review should include your own interpretation of the book, analysis and evaluation of both the author’s and the artist’s work. For you as a reviewer, it is important to investigate how textual and visual elements correlate to each other: whether they contradict or support each other. Now you know how academic paper of this type should be written and what tips are necessary to follow. You may also be interested in our guide on how to write a novel review. Or read the following guide on how to write a poetry book review.